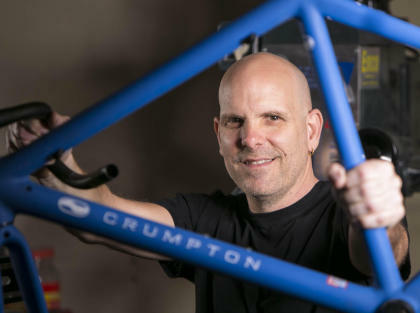 The fit of your Crumpton custom carbon fiber frame is very important. We will take the time to work with you to get the best fit. To get started, please download the Bicycle Order Sheet. After filling out the information completely call Crumpton Cycles to go over your information. Once you decide to order and placed your deposit, you will placed on the build schedule, and a working drawing of your custom frame will be sent to you for your final approval. We ask for a $500 non-refundable deposit* on all custom orders. Please contact us by email or telephone for deposit instructions. We are happy to accept personal checks, cashiers checks, bank issued money orders and wire transfers. Final payment due prior to delivery. All frames are guaranteed, to the original owner, against workmanship and manufacturing defects for 10 years. Complete bike builds are available with Campagnolo, Shimano, Sram, Enve Compsites and Fizik components. Please request a quote when ordering your frame. *deposit transfers allowed by approval. includes Enve Disc RD or GRD(+$225), carbon fiber rear dropouts, Flatmount rear caliper boss, and internally routed hydraulic or mechanical brake lines. Pricing as of 4/20/2019. Subject to change without notice. 31.6mm seat post, 34.9mm front derailleur clamp on all road frames. Shop hours are 9 AM to 6 PM Central, Tuesday thru Saturday. Shop visits are by appointment only. If I am building or riding my own bike, I cannot answer the phone. Please leave a voicemail, and I will get back to you as soon as I can. I answer all emails as quickly as my schedule allows. Please allow one business day for a reply. If you are ready to talk about ordering a bike or a frame from me, download the order form, and fill it out first.